The pine Grosbeak is one of the largest members of the finch family, Fringlilidae. They are found in the boreal forests of Alaska, Canada, Rocky Mountains, and Eurasia. 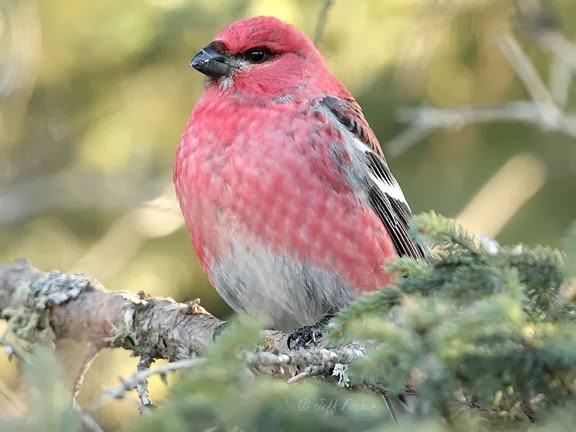 Most pine grosbeaks stay on territory year round but they will migrate south, into southern Canada and northern United States in North America, when there is a shortage of food. They eat seeds, fruit, tree buds and some insects. Males and females are distinctive in color. The top photo here is a female while the red bird in the second photo is a male. They breed in coniferous forests, often building a cup shaped nest in the fork of a conifer tree. They are strongly territorial during the breeding season but during the winter they often feed in flocks, staying near trees with fruit until it has all been consumed. They are also not very wary of people and will come to feeders mostly to eat sunflower seeds. HI jeff Both beautiful birds. It is unusual for the female to be so lovely. I have never heard of it. So so pretty!!! I have not seen either one of these here in south Texas. So this was a special treat for me. This is an intersting bird and in my area a very rare winter guest. 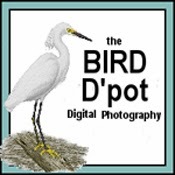 Splendid shots of these beautiful birds. great work! lovely shots with my favourite being the last one! I think they are relatives to our Gimpel(Dompfaff). Great shots of the grosbeak. 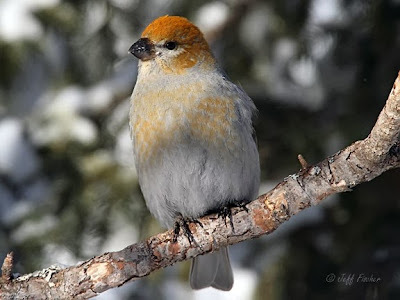 I'll never forget our first Pine Grosbeak, by the side of the road eating the salt (I think), on the way up to 10,600 foot Sandia Crest in New Mexico. I was about to write how wonderful your Snowy Owl images were when I noticed these beauties. I LOVE these, absolutely brilliant and what delightful little birds!